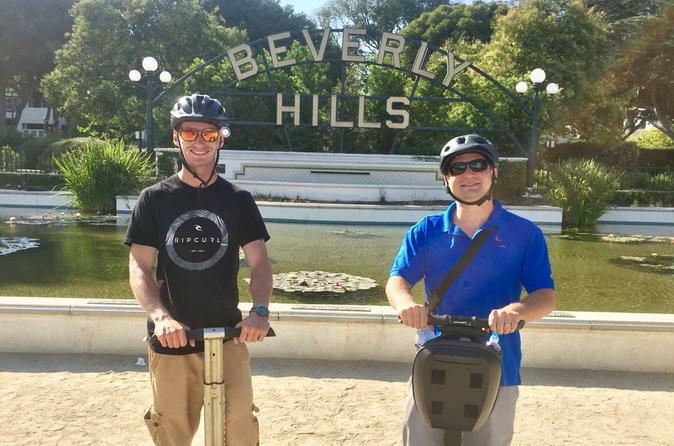 Our Platinum Beverly Hills Sightseeing Segway Tour starts at 9am, Noon, and 3pm. This Segway tour is the perfect way to explore world famous Rodeo Drive, glide past the iconic Beverly Hills sign, and to cruise around one of the fanciest shopping districts in the world. You'll see exotic cars, multi-million dollar homes, and you might even see a celebrity while cruising down some of the most famous streets in the world. Our Platinum Los Angeles and Beverly Hills Sightseeing Segway Tour runs 3 times daily and starts at 9am, 12pm, and 3pm. When you think of LA, what do you think of? Celebrities, Hollywood, Mansions, Fashion, Models, Flashy Cars, Palm Trees, Glitz, Glamour and So Much More!!! Well a Nation Tours’ Segway tour is the perfect way to truly experience all that Los Angeles and Beverly Hills has to offer. Our Segway tour starts by gliding down Robertson Blvd which is lined with many locally owned boutiques, cafes, restaurants, and shops. Next, your guide will lead you to Wilshire Blvd. Wilshire is well know because it is one of the main arteries from Santa Monica to downtown LA, and is home to Century City, the Miracle Mile, and Koreatown. Next, your tour will glide into world famous Beverly Hills. Almost no other city in the world comes close to Beverly Hills. Simply Google how many celebrities and famous people, including athletes live in Beverly Hills, and you will be astounded. While cruising through Beverly Hills and West LA, you will see world famous landmarks including the famous Beverly Hills sign, Rodeo Drive, Beverly Drive, and you might even see a celebrity or two heading to their favorite salon or coffee shop. Gliding on your Segway through Beverly Hills, you will also have a chance to see some of the most valuable real estate in the world and see one of the most bustling shopping and entertainment districts you will find anywhere. Cruise past multi-million dollar homes and mansions, see countless luxury and exotic cars made by Bentley, Ferrari, McLaren, Rolls Royce, and much more. So, uf you are looking for a tour that shows you the most exciting part of Los Angeles, look no further.